Status: Alive. Paired with Lofty (2011 male) 2016: Made one nesting attempt 2 eggs, both hatched, one chick fledged. 2017: Made one nesting attempt 2 eggs, both hatched but later missing, cause unknown. 2018: Made one nesting attempt 2 eggs, both hatched but chicks failed to fledge. 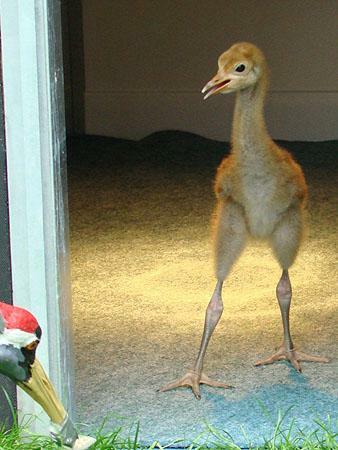 September 2012: Gibble is a bit of a grumpy bird and is very fussy about which birds she socialises with. At Slimbridge, she loved to stay near the feeder and soon let the other birds know if they got too close. She has a striking ginger head and dark grey body. 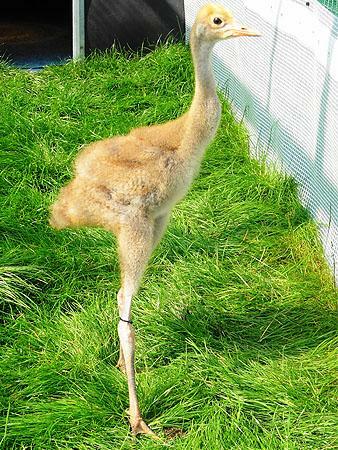 Once transported to Somerset, she began to tolerate the presence of most of the other cranes, and has properly integrated into the flock. January 2013: As autumn turned to winter, the cranes began to flock together to look for food, which they found in plentiful supply in the form of maize left in fields from the harvest. All 48 have been spending most of their time either feeding in the maize stubble or down on Stan Moor, completely unperturbed by the surrounding floodwater from the recent storms. January 2014: 2013 was a largely uneventful and peaceful year for Gibble, spending the spring and summer on Aller moor and West Sedgemoor, the autumn feeding in and around the Stoke St. Gregory Ridge and Stanmoor and the winter flood period on Stanmoor pasture, pulling up worms as part of a large flock. The most exciting thing was the arrival of the new cohort of young cranes in the autumn, which caused a fair bit of disruption in the hierarchy! July 2015: In mid April 2014, Gibble was seen briefly in Gwent, South Wales, along with Lofty – which was possibly the start of their coupling. The summer, autumn and winter were spend on the Somerset Levels and Moors but in late February 2015 Gibble turned up at Slimbridge with Lofty, and was next seen in South Wales again near the Newport Wetlands reserve. They were clearly a pair, and moved between Slimbridge and South Wales through the spring. The pair were not seen for around a month and half in the middle of the breeding season and it is possible that they did make a breeding attempt somewhere. However, they were seen again as a pair during May and in early June without any young. February 2016: Gibble spent the remainder of the summer, the autumn and all winter on the Somerset Levels and Moors. July 16: Seen behaving as a pair again with Lofty in Somerset in January . Possibly at Slimbridge with Lofty in March but not seen after that. Thought to be the pair observed to be nesting near Newport, South Wales. Incubation is thought to have started in early April and hatching around 9th of May. Two chicks hatched but by late June only one was present . 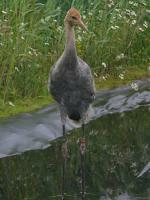 Gibble was seen with Lofty and a the single chick, which is due to fledge at the end of July. Aug 16: UPDATE! Gibbles chick fledged - a first for Wales, well done Gibble. Nov 17: Seen behaving as a pair in Somerset during the winter months . 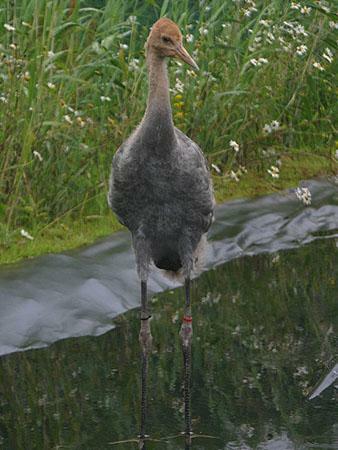 On 12th March two cranes were reported to be back on the Gwent Levels and identified later as Lofty & Gibble. On the 3rd April, Gibble was observed incubating, and on 1st May the pair were reported as having hatched 2 chicks. The two chicks were still present on 30th May. A month later on 30th June the adult pair were flying around alone, having lost their chicks. The cause of the loss is unknown. Observed back with the flock in the Autumn. Sept 18: Reported with Lofty back in S Wales nest site on 22nd March. Reported that incubation started on 4th/5th April and that hatch occurred around 2nd May. On 25th May reported that L&G were seen at Goldcliff without chicks – so failed at chick stage. 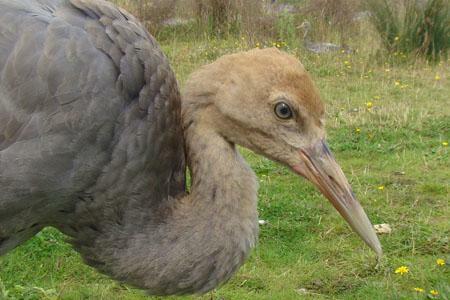 Gibble was seen with an unringed bird in August - possibly their three year old juvenile (Garan). Lofty has not been seen since late summer.